Citi Bike began installing a batch of 121 139 new stations this morning, kicking off a 2016 expansion phase that in Manhattan will reach up to 110th Street and in Brooklyn will extend to the neighborhoods between Red Hook and Prospect Park. All told, Citi Bike will be growing from about 470 stations and 8,000 bikes to about 590 more than 600 stations and 10,000 bikes this year. In addition to the expansion areas, Citi Bike will be adding some infill stations in the current service area on the Upper West Side and Upper East Side, where the station density initially fell short of recommended standards. Station density is a key factor in the success of bike-share systems since it cuts down on the time users spend walking to and from stations. The 2016 expansion is the second year of a phased, three-year plan that in 2017 is expected to extend up to 130th Street in Manhattan, further into western Queens, and into parts of Crown Heights in Brooklyn. 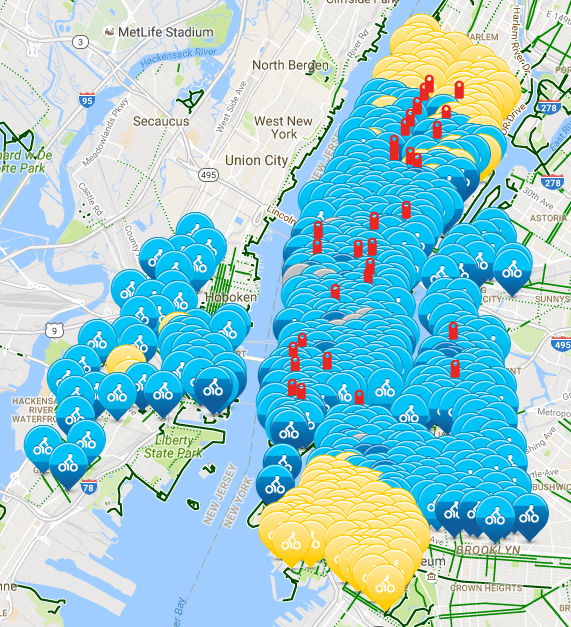 The new stations coming this year are shown in yellow on the Citi Bike map. Check the map to monitor when new stations are operational. Citi Bike continues to get impressive use. This spring and summer, users have routinely exceeded 50,000 trips per day, which works out to more than six daily trips for each bike in the system. DOT is also putting down new north-south protected bike lanes this year in the expanded service area. The Amsterdam Avenue protected bike lane, a northbound route between 72nd Street and 110th Street, is mostly complete. And an extension of the protected bike lane on southbound Second Avenue from 105th Street to 68th Street is currently underway as subway construction wraps up. That will leave a gap on Second Avenue between 68th Street and 34th Street, which DOT plans to partially fill in next year. Updated to reflect accurate number of stations being added in 2016. They are putting one on my block! They already added a bunch of stations to Jersey City last month. The 3 yellow ones on the map for JC are just the ones they haven’t finished yet. This is great–now when will they come up to 130 St? I live 2.3 blocks south of the most southern station. – Oh and a station catty corner from the Gowanus Whole Foods. Nice! They should be planning to expand throughout the city. Aww, so cute. One day we’ll catch up with the 66,500 bicycles and 2,700 docks in Hangzhou, China. Eventually, they might even reach ungentrified neighborhoods! Maybe they’ll reach my neighborhood sometime before I’m on Social Security. So’s 80% of Brooklyn, 95% of Queens, 1/3rd of Manhattan, All of the Bronx and SI. I’ve got two coming on my block. They’ll probably be up to 130th St in Manhattan before the end of next year. What about Citibike stations in poorer neighborhoods where the subway often stops running on the weekends ie Manhattan 168 – Inwood – maybe never? I wouldn’t call East Harlem gentrified… yet. A few weeks ago there was a CB8 (Manhattan) Transportation Committee meeting that had as an agenda item reducing the size of some CitiBike stations on the UES (including one on my block). I didn’t go to the meeting, but does anyone know the story about the move to shrink some docking stations? The one on my block (at 85th and York) is usually empty well before the morning rush is over, so I doubt it was getting shrunk for lack of use. Are they doing this in other neighborhoods, too? That’s where I am, and it’s a huge missing link, especially considering how many people travel to and from Columbia Presbyterian Hospital. Good grief, what an obnoxious map. I’d like to see the ones that were rejected. looks like a medical textbook illustration. It’s pretty obvious that Citibike isn’t even remotely for the poor and working class. Only in Manhattan, of course. Meanwhile Queens residents must drive and take buses because many of our neighborhoods lack local subway access. Three years and nothing in the two fare zones of Queens. Why? THIS IS WHAT’S GOING TO GENTRIFY IT! What would the point be of putting station up at 168th if there are none between there and 86th? They started in the most densely populated parts of the city with the most bicycle commuting and they’re moving outward. The stations will eventually come. Basically what JudenChino said. NIMBYs. Wow! In all seriousness, is it working well for them in Hangzhou? Multiple residents were also concerned about the proposed site on 78th Street west of Second Avenue because it would block access to a community health center. I love just how ridiculously stupid some of these people are. I used to live on the far east UES and I wish we had Citibike back then . . . at least so I could shlep to the Lexington line. What was Citibike thinking? Why didn’t they do their homework? Hello McFly!!! Perhaps they were thinking maybe some people would like to bike to the community health center? Like going there is an errand. People have many errands in a day. A bike station there will cause people to save time. I mean . . . it’s not a poison dispensary. It’s a means to get from point a to point b that is faster than walking. Why’d they put it near a school? Maybe so people can bike there? What is it about bikes that cause people to turn off their critical faculties. There’s an oceans of cars and trucks going up/down the avenues . . . but yes, a bike station that removes a handful of parking spots is The Worst. I bought an annual pass 3 months ago to save me the 10 minute walk to the subway every morning. To date I have found an available bike at my local station ONE TIME. Once! There are 3 other stations within walking distance and it’s the same story in the mornings. I understand that being far from a subway the service is going to be popular, but for some reason I had presumed that Citi Bike would be competent enough to identify these high traffic locations and keep bikes fairly distributed between them. HA! What an utterly useless company. I wasted $150 on this crap. Don’t get too excited. Like most stations it will be consistently empty when you need it most. Citi Bike were supposed to address complaints about the poor distribution of bikes 3 years ago and they have done jack sh*t about it. I have one on my block too – there is NEVER one single operational bike there between the hours of 7am and 9am when you need it most. Sometimes the app will tell me there are 10 bikes there and I rush out excitedly to find not one single one. I leave earlier than you do. I like bike share and use Citi Bike sometimes, but it is definitely not mass transit and is only useful for commuting for a lucky few who leave at the right place at the right time. There are no stations where I live, but there is one close to my midtown office. But consider this: I would estimate that there are at least ten thousand workers for which this is the closest Citi Bike station. The station has capacity for about 40 bikes. That means that if even one percent of workers want to use a bike when they leave from work (most within a relatively narrow time window), most of them won’t be able to take a bike. There is no way for Citi Bike to rebalance the bikes against such a tide. The only hope of making it significantly useful for commuting would be to increase the number of bikes tenfold or more. Bike share is more useful for non-commuting trips, in certain areas, at non-peak hours. If you want to use it for commuting and have some scheduling flexibility, you can investigate the times at which your stations get empty or full and act accordingly (of course, that can turn into an “arms race” against other commuters). For example, I know that the station near my office is practically full at 4:50 pm but already empty by 5:10 pm. I am totally on the same page as you. I never get a bike in the morning and when I bike back from work/school there is never an empty bike slot. Will Citi Bike Riders Get a More Convenient Network for Their Higher Fares?